This article will summarise the key purpose of 'Checkpoint', how to access the settings, configure your Checkpoint Types, Create Checkpoint IDs, and monitor the system. 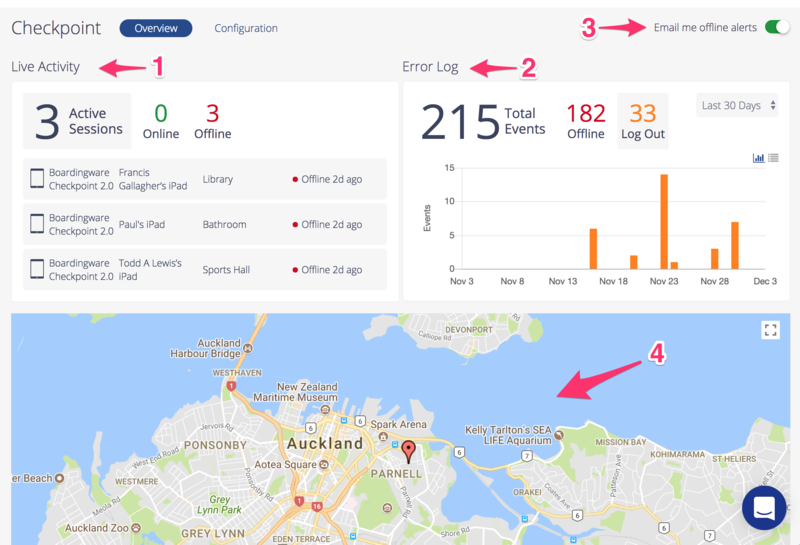 Checkpoint allows you to monitor key information and alert yourself to offline events. Read below for how to get the most out of this section. 1 - Live Activity - See here for an over view of which of your checkpoints are online. Click on the online or offline number to narrow the list down. 2 - Error Log - This displays all log-outs and offline events. You can click on the box on the right to look at different date ranges, or below on the 'graph' and 'list view' options to toggle how the information is displayed. 3 - Email notifications - Simply toggle this on if you would like to receive email alerts whenever an offline event occurs. 4 - Map - To give you a visual understanding of where each checkpoint ID is set-up. Click on the red-marker on the map to bring up more information. 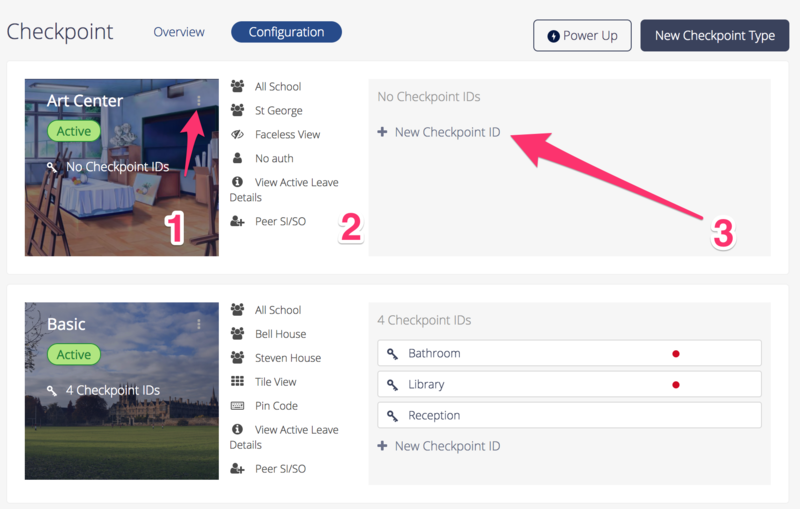 Each iPad in the school will require an ID, these are unique and attach to Checkpoint Types which determine the settings/permissions. To set up a new type, click New Checkpoint Type in the top right. 2 - Checkpoint settings - This is a summary of the settings that the type is using. 3 - Checkpoint ID's - Each individual iPad needs a Checkpoint ID. Click 'New Checkpoint ID' to create some ID's for your Checkpoint Type. (Scroll to next section for details. Tip: On the 'Basic' type in the image above, the ID's: Bathroom, and Library both have red dots. This signifies there is an iPad using each of those ID's and they are both currently offline. 2 Assignments - Choosing which students have access. 3 Options - Configuring the way any Checkpoints using this Type can be used. Description of settings below. 4 Checkpoints IDs - Which Checkpoint ID's are assigned to this type. See video below for a Checkpoint Type getting created. 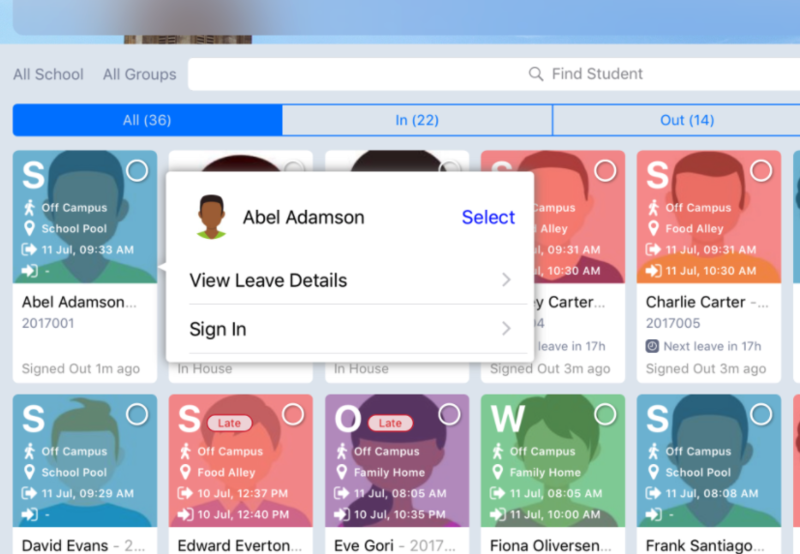 Allows groups of students to sign out at a time. Active Leave details can be viewed when a student is signed out. Note: If the PIN code option is on, the students will not be able to view each others active leave details. Requiring the use of PIN codes will force students to authenticate their activity before using the Checkpoint device. 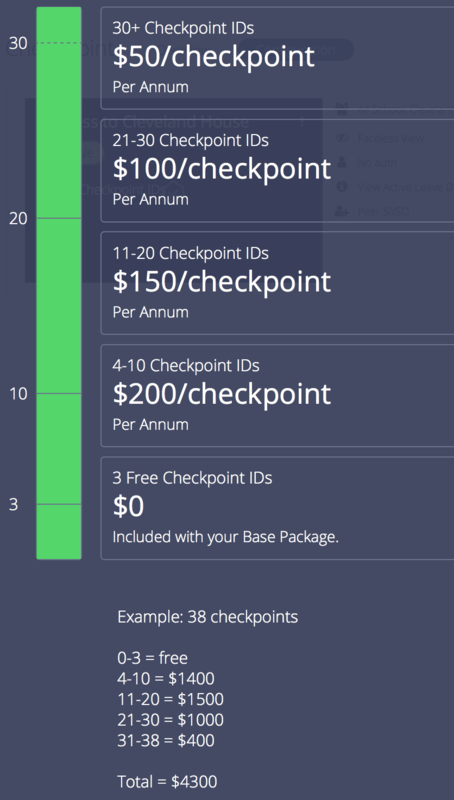 As a default you will be allotted 3 free Checkpoint ID's. The cost per Checkpoint varies depending on how many your school requires. See below for an example of pricing broken down per license band. If you are an existing customer and are interested in enabling Checkpoint Manager, please get in touch with your appointed Customer Success Manager, or email support@boardingware.com to find out more.